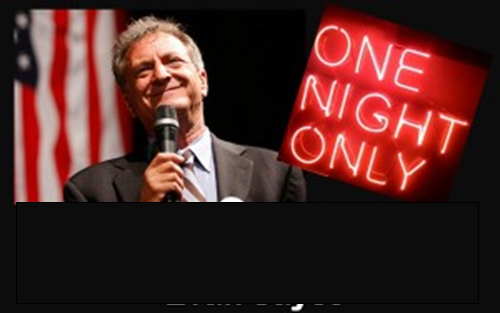 After playing to a packed house (and receiving not one, not two but THREE standing ovations in Los Angeles last month) Evan is reprising his one man show as part of the acclaimed Ventura Comedy Festival for one night only, September 28th at 7 pm. Tickets are just twenty dollars and can be purchased online by clicking here. They will also be available at the box office on the evening of the show. In case you don’t know Evan’s work, watch a brief clip from an event he starred in along with Ann Coulter and Dinesh D’Sousa earlier in the year by clicking here (feel free to share) Also see the reviews from the nation’s leading political activists, radio talk show hosts, authors and others below. This is a RARE, open to the public performance and NOT to be missed! To make life easy, here’s the link again to BUY TICKETS NOW! And now….just some of the reviews of Evan’s shows. Here’s that link to tickets again Get them now and please spread the word. SEE YOU ALL THERE for a night that is ALL RIGHT!